Adam Gibbons remembers his home-produced 2007 debut. 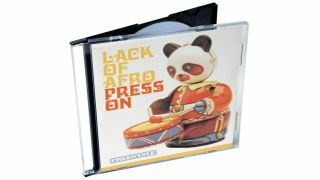 Before the five studio albums, sample packs, tours, and music for films and worldwide ad campaigns, Lack of Afro was just another struggling funky breaks producer. Back in the mid-noughties, the man behind the moniker, Adam Gibbons, was a young buck, working for Sky TV in London. After his usual 12-hour shift he’d ride the train home, bumping beats and scribbling down mixing comments in his little notebook. Then it was back to the bedroom studio to fire up his monolithic Dell laptop, boot up his pirated software, and work until the wee hours of the morning, fine-tuning his tracks. Thankfully, his all-consuming beatmaking lifestyle yielded results. The meticulous drum programming, perfectly snatched vocal samples, and countless intricate references to vintage funk and soul that pepper his debut LP could only have been achieved by someone with this insane attention to detail. Press On was written as an album. Each song purposely created to make it work. The intro welcomes you in, and it builds from there. He samples and plays live funk and soul, Latin and breakbeat, gaining momentum as each track finishes, before setting up for the downtempo closer. Not a second of filler gets airtime. “I had such a singular vision of getting an album out,” he says. “You get into a rhythm of writing tracks, and when you’re in a good one, you just roll with it.” Something we can all identify with. Adam’s musical momentum continues today. His beats can be heard on ABC, Fox, and NBC, and his brand new (sixth) Lack of Afro album, Jack Of All Trades, is just about to drop on his own LOA Records imprint in May. His younger self would be proud. Here, Adam takes us through his fledgling labour of love, track by track. “At the time, I was deep into Endtroducing. That was a massive album for me. I love DJ Shadow and that whole instrumental hip-hop thing. I also loved all the Grand Central and Aim stuff. He was a big influence, as well, with his album Cold Water Music. They all had intros, so I had to have one on mine. “I’ve got a lot to thank this track for. This is probably the one that people most know - people still sing that horn line at me! “It’s based around a nice horn riff sample, then it went from there. It’s one of those tracks that came together quickly, too. “I loved this drum loop. At the time I had all these samples and cuts, trying to make them work together. I was just trying to sound like Cut Chemist with this track, I think. His track Lesson Six. I loved that. “I remember recording the bassline was a real struggle as I didn’t really play much bass at all back then. I would just pick up instruments up and learn stuff as I went along. “This features a sample of Steve Marriott, who was in the Small Faces. My publisher cleared that with his estate and EMI. He did a lot of legwork to get that one, so hats off. “The Small Faces are one of my favourite bands ever. His voice was just incredible, and for me it stacks up against some of the greatest soul voices - and it came out of this little five-foot white cockney. “I got a friend of mine, Nick Radford, to play some guitar on here. He was really good. I met him when I was putting a band together for a wedding. I’d been through a few guitarists by this point. Either they didn’t get it, overplayed, or were just heavy indie rock players. “Nick plugged in and started playing and he just... got it. I was just after something nice. I was listening to a lot of downtempo stuff at the time, like Bonobo and Quantic, so I knew I wanted to represent that and get away from the whole dancefloor funk breaks stuff for a bit. There had to be a balance. I remember thinking that I needed to make these types of tracks to break the album up. “The drums were a sample of The New Mastersounds. That band was pretty integral to Press On as a record, because a couple of the tracks contain drum samples from their drummer, Simon Allen. “I’d seen them at university back in 2001, live, and I was blown away. I got their debut album [Keb Darge Presents: The New Mastersounds] and just went through it, and I came across these drums. “This was my first single and the track that initially got me signed to Freestyle Records. At the time, I was in a DJ crew called The Root Down, led by a friend of mine called Heavy Stylus, and unbeknownst to me, he had uploaded this track to the Ninja Tune forum where Jon Sheppard (A&R at Freestyle Records at the time) had heard it - and it all went from there. “This track features Charlie Hearnshaw (my saxophone teacher at the time) on alto sax, and Toby Mentz on bass. I’ll leave it to the sample spotters to figure out where the opening vocal sample comes from. “One of my favourite Cannonball Adderley albums is called Live At The Club. They recorded it live in the studio in front of an audience. I wanted to make a track like it was a band playing in a club, in front of an audience. So I got applause samples and crowd noises and mixed them in. “This has Nick Radford again, playing guitar. It references The Champ by The Mohawks - everyone thinks that’s a sample, but it’s actually me playing. 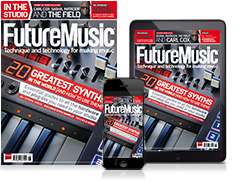 “It also has a spoken word sample on it of Bob Moog talking about synthesisers at the end, just before some synths come in, played on my only synth, the Novation K-Station. “This is an Arctic Monkeys song. I love them and could always hear a funk track hidden in there. All of a sudden, it was something I just had to do. It’s my only ever cover version. “This track is completely live. No samples, nothing. I was really nervous, as Eddie Roberts from The New Mastersounds is on this. I was on drums. I didn’t consider myself to be a great drummer, but I knew enough. “On bass was a guy called Neil Innes, who brought down a Fostex R8 eight-track, reel-to-reel tape machine, and some Neumann M149 mics to use as drum overheads. “This was the second single off the album. I wanted to make something beat-heavy. Drums were really important to me; crucial for the whole album. “A guy called Flevans - a good friend of mine who was signed to Tru Thoughts - had a track called Spooked that I really liked. It was all based around cut up jazz drums. The jazz drums section in Roderigo is a little nod to him. “I was just trying to be DJ Shadow on this track. That was my remit. It had the spoken word thing in there, and then the heavy drums with the quite mellow sample. “I was a big fan of spoken word stuff - they helped set a scene. I wouldn’t do it as much now. That whole thing is of its time. I used a lot of them then, because I didn’t have vocalists, and DJ Shadow and Aim were doing it. “Then we added some Nick Radford guitars. It all gave it a nod to Endtroducing, as if there hadn’t been enough [laughs]. To find out more about the latest album, Jack Of All Trades, or up-to-the-minute tour dates, hit up the official website.